Celebrating the life of George Andrews, Jr.
Obituary for George Andrews, Jr.
Mr. George Andrews, Jr., 92, passed away April 10, 2019 peacefully under the care of Hospice. George Dewey Andrews, Jr. was born May 17, 1926, in Greensboro, NC. He was united in marriage to Jean Evelyn Andrews for 70 wonderful years prior to her death in March, 2016. Dewey and Jean are survived by children, George “Andy” Dewey Andrews III, Debbie and Charlie Leverett, and Kelly Andrews; grandchildren, Chris, Cindy, Steve, Keeley, Carolyn, Phil and Faith; and great-grandchildren, Ben, Anna, Josh, Sam, Kynlee, Whitney, Wyatt and Henry. 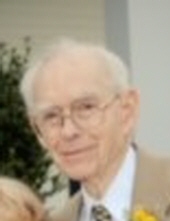 Mr. Andrews was a member of the First Baptist Church in Greensboro and Durham. He was a deacon, taught Sunday school, coached basketball, and volunteered at church events. Dewey also spent his free time as a scout leader, little league coach, avid tennis player and sports enthusiast. He was a U.S. Army veteran of WWII. Dewey worked for years at NC Mutual as a buyer, then later on instead of retiring, worked as an accountant and with young people in afterschool and summer programs. He always had a nice word to say and was a source of wisdom for many youth in church, sports leagues, and within the community. Dewey spent years of his life giving back to others, with two of his favorite’s being the Optimist Club and Civitan Club – where he was past president and chaplain. The family will greet friends prior to the service from 10 to 11 a.m. on Monday, April 15th at Clements Funeral Home in Durham with Pastor Kent Butterfield officiating. A funeral service will follow in the chapel at 11 a.m. Burial will follow the services in Brier Creek Memorial Gardens. The family wishes to thank Alamance House, Hospice and the team of caregivers who worked with us, as well as, our family and friends. In lieu of flowers, please consider making donations to the Durham Civitan Club: PO Box 61152, Durham NC 27715. To send flowers or a remembrance gift to the family of George Andrews, Jr., please visit our Tribute Store. "Email Address" would like to share the life celebration of George Andrews, Jr.. Click on the "link" to go to share a favorite memory or leave a condolence message for the family.